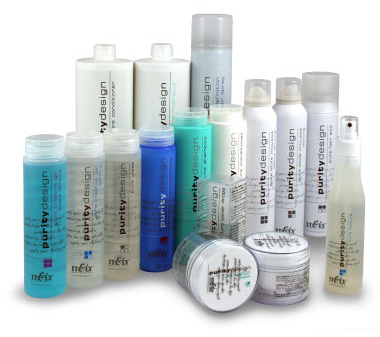 Italy Hair Fashion Purity Design Products. When it comes to styling my hair, I am always overwhelmed by which products work and work right for my hair. Finding products that are gentle on my hair while adding volume and providing the proper amount of hold and keeping my hair nourished and hydrated are my number one concerns. I rarely stick with a while line of products as I tend to use a serum from line a, a mousse from line b, hair spray from line c, etc..That is, until now. I was given the opportunity to test out the entire range of Purity Design products from professional brand Italy Hair Fashion, and I can say it was almost as if the Purity Design line of products were made specifically for my hair type, and more importantly my hair needs! All of the Purity Design products are made with their exclusive "Desert Blend". This blend is made up of important proteins found in desert plants, including Agave, Joshua Tree, and Cholla Cactus. The scent is divine; it is a clean, hearty scent, but not overpowering. Firm hold and volumizing mousse that gives shine and control to the hair. I have been using this daily in my routine for lot's of volume and control. Extra firm hold and volumizing mousse that gives shine and control to the hair. Volumizing and moisturizing texturizer that gives body to all hair, even the finest. I use this at the roots of my hair when I am looking for an extra amount of lift when wearing my hair down. A light modeling glaze especially designed to protect and to give shine to the hair. I like to use this when I pull my hair back or wear it up for extra definition and shine. Strong creative gel, ideal for modeling and creating a unique style. It protects from UV rays, it nourishes and makes the hair shiny. Extra strong gel, Ideal for modeling and creating a unique style. It protects hair from UV rays. My up-dos are much simpler when I use this gel. It helps me to create my style and holds my hair inplace. A wax ideal for modelling and stressing special hair strains. This light hold paste is ideal for modeling and stressing special hair strains. I rub a small amount of this paste in between my palms and run it through my hair when I am trying to separate curls or chunky sections of my hair. Ecological medium hold spray, ideal to model, hold and give volume. I spray this on my hair then brush it when I am pulling my hair back into a ponytail or wearing it up. Strong hold hair spray that gives volume and a long lasting hold to the hair. I have been using this strong, yet flexible spray on my hair for everyday use. It holds my hair in place while keeping it looking natural - never stiff. are contained in this product and have high hydration to even help prevent split ends. Modeling fluid medium hold. It’s high hydration faculty leaves hair extremely soft and shiny. To see where the line of Italy Hair Fashion is carried near you, as it is only sold in professional salons, navigate to your area in their Distributor Locator Tool. NARS Velvet Gloss Lip Pencils.